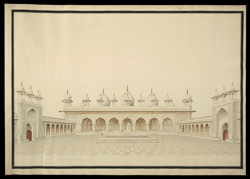 Watercolour of the Pearl Mosque (Moti Masjid) in Agra, by an anonymous artist working in the Agra style, c. 1817. The mosque was built inside the Agra fort in 1654 during the reign of Shah Jahan (r. 1627-1558). Built principally as a military establishment by Akbar in 1565, the red sandstone fort at Agra was partially converted into a palace during Shah Jahan's time. This view shows the courtyard of the Pearl Mosque with side arcades and arched recessions and the main sanctuary facade beyond. The sanctuary is roofed with three bulbous domes and a series of Hindu-style domed kiosks along the parapet. It has seven bays divided up into a number of aisles and supported by piers and lobed arches. The extensive use of white marble facing is a typical stylistic feature of Shah Jahani architecture.